We should learn by now not to pay attention to time when it comes to O’Neill’s works. Clockers got Nyquist 5f in :12 3/5, :24 4/5, :37 1/5, and 1:02 3/5, out in 1:17 1/5. A private clocker, commenting on Twitter, got him 7f in :13 1/5, :26 1/5, :38 3/5, 1:03 4/5, 1:16 1/5, and 1:29 3/5, out in 1:43. That’s not even close in time or distance, so who knows how far and how he fast he actually worked. In another tweet, O’Neill said he went a mile 1:50. So, with Nyquist’s works, it is strictly visual and is fruitless to try to form any opinions or conclusions from time, especially when three respectable clockers have him working different distances, and two have fractions nowhere close to each other. Based on the works of his I’ve seen, they are usually timed at 5 furlongs because that’s when begins picking it up. But his run-up is so strong, starting from the finish line or seven-eighths pole, he basically works closer to a full mile. In any event, it doesn’t really matter, because he’s never been beaten, so what he’s doing obviously is working. Also, these long works or training sessions are what he needs if he’s going to try to win the Derby off only one two-turn race and a sprint. Surprisingly, his Thoro-Graph figure for the Florida Derby was nothing to get excited about, and was a slight regression from his San Vicente victory. And despite the eight-length drubbing he gave Mohaymen, his figure was only two points faster. Even in a year like this, with mostly slow numbers, he needs to move forward at least a couple of points if he’s going to win the Derby. That is, of course, if you swear by the speed figures. Despite his solid and relatively consistent figures, and basically running the same numbers he did early in his career, he is undefeated and loves to win, and we’ll see if that can trump his light campaign and lack of improvement speed-wise. I merely mention the speed figures as a point of interest. When young 3-year-olds go 1 1/4 miles for the first time in a 20-horse field, speed figures take on less importance, as there are too may intangibles to rely heavily on them. Despite being challenged by a horse owner/acquaintance to have the (nerve) to step out of the box and put Exaggerator at No. 1, I chickened out again. But with a few weeks to go, I am still teetering on the edge, trying to figure out just how Exaggerator is going to run in the Derby and on a fast track. His Thoro-Graph figure for the Santa Anita was right where you want to see it. It was a good move forward, but not such a big jump that he’s going to bounce off it. Even if he pairs up that number or regresses slightly, it still should be fast enough to win this year’s Derby. I really don’t want to see him as far back as he was in his last two starts, because of the number of classy deep closers in the field (see Creator) and with so much traffic to encounter while moving at such a rapid speed. What I like about him is that he should get first jump on the closers in a field devoid of strong mid-pack horses. Although he didn’t come home fast in the Santa Anita Derby, he made a good portion of his move with :23 3/5 and :23 2/5 quarters, moving with such force, he took himself wide at the head of the stretch. With his new style of running and that Howitzer move that can blow a race to smithereens in the blink of an eye, there is the distinct possibility that we could be looking at the most improved 3-year-old in the race, regardless of the track condition. Remember, he did make the same explosive move in the San Felipe on a fast track, but it was something so new and different from what he’d been used to, he just didn’t have the same control over the move and confidence that he had second time around in the Santa Anita Derby. Perhaps the wet track helped him, but not to the degree some think it did. He didn’t exactly show dramatic improvement in the mud before; he just showed he could handle it well in a close victory at Delta Downs and a second-place finish at Keeneland. Picture the Derby as a buffet table filled with gourmet delicacies except for a bowl of mac and cheese. It’s nice to excite your palate with various types of taste sensations, but in the long run it’s the comfort food you appreciate the most. Well, consider Mor Spirit the Derby buffet’s comfort food. He is not going to get your pulse rate climbing or the adrenalin flowing like Baffert’s piece de resistance from last year, American Pharoah. He’s more of the calming influence who is consistent and reliable and is just nice to have around. When he wins he doesn’t do it with a lot of flair. He just shows up first when they cross the wire and makes you wonder how he got there with such little notice. With all the lightly raced horses and number of scintillating late closers in this year’s Derby, he just does his thing and shows up every time, ready to go to work. There is something very refreshing about that. What he needs to improve is getting in high gear sooner and showing some kick from the quarter pole to the eighth pole, because if he’s not right there at that point, and waits for the sixteenth pole, as he’s done in several races, he’s going to find a cavalry charge of closers storming up behind him. In his seven career starts, in which he’s never finished worse than second, only once did he make up as much as two lengths from the three-quarter call to the stretch. In all his other races, where he was at the three-quarter was pretty much where he was at the stretch call. That is where the Derby is often won. He isn’t your typical Gary Stevens type of horse, but no one can push a horse’s buttons like Stevens, so look for him to begin the grinding process sooner and put him in position to win. Like with another of Stevens’ mounts, the enigmatic Mucho Macho Man, if he can manage to strike the front before the eighth pole, he just may prove difficult to catch and pass. His tail-female family traces back to War Admiral three times and twice to the great La Troienne, as well as the Phipps’ foundation mare Striking. The Thoro-Graph figure for the Blue Grass obviously showed a fairly substantial jump forward from the Tampa Bay Derby fiasco, but, like Nyquist, who got the same number in the Florida Derby, he would need to improve several points at Churchill. Between Thoro-Graph and the Beyer figure, this was not a fast race. He’s never run two fast races back to back, but he sure does look impressive from a visual standpoint, and he has the ability to make his move a little earlier and can knife his way through the field. The big question is whether he’s fast enough to outclose all the other deep closers and move forward enough off his last race to win the Kentucky Derby. And remember, his best races have come at Keeneland. These speed figures are merely a handicapping tool that some take more seriously than others. I certainly would not rely solely on sheets numbers, which are much more comprehensive than the Beyer figures. Many big bettors and owners and trainers swear by them. Just look at how they dictated Destin’s entire preparation for the Derby. But when it comes to the Kentucky Derby, as mentioned earlier, there are so many intangibles and so much luck involved, the race cannot be broken down and deciphered in numbers alone. So, if you like Brody’s Cause, you’d be foolish to go off him because of speed figures, but if you follow the Beyers and speed sheets numbers, you do have to approach the race with a modicum of uncertainty. However, for the ethereal thinkers, remember that Romans was my early Derby gods favorite, and they were sure looking out for him in the Blue Grass. He is going to have his critics, who I’m sure will feel I’ve lost my mind putting him this high up and ahead of the horses who beat him in the Arkansas Derby. But somewhere at some point he is going to finally get a good trip and if he does in the Derby, his explosive turn of foot on the far turn will have him right there at the quarter pole, and this year that’s all you can ask. Even if you don’t like him to win, I have him ranked this high because he has as much chance of finishing in the money as any of them. That’s why I have him ahead of one of my favorites all year, Suddenbreakingnews, and the horse who beat him, Creator, because of that turn of foot and the belief that he is more likely to get first run and put himself in position to win. Just once I would like to see how he can close without all that ground loss. Three times now he has made a powerhouse move on the far turn, but simply could not overcome the loss of ground and in the case of the Arkansas Derby, a horrible trip from the start. I was expecting to see him in midpack, but when Dazzling Gem and Luna de Loco put the squeeze on him 100 yards after the start, he had to check, clipping heels and stumbling, and finding himself back in 11th, some 13 lengths off the pace and a length behind Suddenbreakingnews. When Ortiz asked him for his run, while racing about four-wide outside horses down the backstretch, he went right by Suddenbreakingnews, but got fanned 7-wide at the top of the stretch, while Creator was able to rally along the rail before easing out and finding a perfect seam between Unbridled Outlaw and Discreetness that you could fit two or three horses through. Creator kept coming out into Whitmore after turning for home and finally just had more firepower in the final three-sixteenths. So while Suddenbreakingnews and Creator have a bigger closing kick, he has the kind of rapid-fire acceleration on the far turn that is more conducive to the Kentucky Derby. He has already won at 6 furlongs this year, which I love, while sitting 1 1/4 lengths off a :45 4/5 half. And remember, he broke his maiden by 7 1/4 lengths in his career debut at Churchill Downs, stalking a :21 3/5, :45 3/5 pace. Moquett may not be a big name, but he’s an excellent trainer, and I would expect him to have Whitmore sharp for the Derby, so he can show more tactical speed and get the jump on the deep closers with that excellent turn of foot. He’ll be a huge price and it would not be wise to ignore him, at least for a piece of it, despite his three straight losses this year. Oh, yes, co-owner Robert LaPenta is owed a Derby after his agonizing second-place finish with Ice Box, who had a nightmare trip in 2010 that most feel cost him a sure victory. LaPenta would love to get his revenge on WinStar, who won that Derby with Super Saver, who had a dream Calvin Borel trip up the rail. I can’t help it, I still love everything about this colt, and admire his consistent big late kick, and definitely see him flying at the end in the Derby. I’ve decided to shake up the Dozen this week, and with my gut, or perhaps a little of my heart, whether most people feel it makes sense or not. Shows you how confusing this race is. But I do admit he’s shown another consistency all year that can hamper his chances of winning. He either does not have the necessary acceleration on the far turn to put himself in position to win or he’s being asked too late for his run. It appears as if Quinonez is simply waiting too long, but he claims the horse wasn't handling the track too well when he did ask him. But he cannot let horses pass him on the far turn. This colt has shown a lot more speed and versatility than that. I like that he was a bit closer this time, but once again he let Whitmore and Creator get the jump on him, and he simply was left with too much to do in the stretch, and again wound up fanning seven-wide turning for home. Therefore, as much as I love him and feel he has the talent and pedigree to win the Derby, I see him more as a place or show horse, unless Quinonez can get him in gear earlier, so that he at least can have victory in his sights when they turn for home and not have to pass so many horses in the stretch from out in the middle of the track. You often see a horse running that way in the Derby to get second, but rarely do they win that way. But, boy, can he close, and maybe he can get lucky this time and not have to try to run down the entire field. And remember, he was giving four pounds to the first, third, fourth, and fifth-place finishers. Even deep closers who have won the Derby have found themselves in contention turning for home, such as Orb, who came from 17th, but was only 4 1/2 lengths back at the quarter pole and a head back at the eighth pole. If this horse is within four lengths of the lead at the quarter pole I don’t know that there’s anyone who can outclose him. This is another move from the heart and gut. As mentioned, the Blue Grass got a so-so Thoro-Graph figure, but so did most of the other preps, and his number was only half a point slower than Brody’s Cause and he is on an excellent pattern, improving at a steady clip. Whether he’s on target to peak in the Derby or the next race, it’s difficult to tell. Horses with only four career starts have a big disadvantage in the Derby, as only two horses with four starts or fewer have won the Derby in the past 98 years. If he, like Outwork and Shagaf, had one more start, I would definitely rank them higher. He would need to improve a couple of points in the Derby, and that is well within his grasp if you consider how he keeps moving forward off each race. Speed figures aside, I love what I’ve seen of this horse in his last three starts. He can start his run a long way off and sustain it for a long period of time, while continuing to build up momentum through the stretch. The key to his Blue Grass performance, as mentioned last week, was that he was able to run down a horse who himself was closing fast from the back of the pack. That is the sign of a true closer with a relentless stretch kick. But like all the deep closers in the Derby this year, he is at the mercy of racing luck, and you would prefer it if he didn’t have to swing 7 or 8-wide turning for home as he did in the Blue Grass. If any of these deep closers are going to win the Derby they will need to have the versatility to move earlier, save some ground, weave their way through traffic, and be at least in a striking position by the time they turn into the stretch. Only racing luck and/or a superior ride is going to accomplish that. His owner, Sheep Pond Stable, has had more top-class stakes horses in the short time they’ve been in racing than any new owner could ever hope for, so they seem to have the Midas touch. And, win or lose, they have found a good one in My Man Sam. And I feel we’ve only seen the tip of the iceberg with this colt. Before you express shock that he’s only ranked No. 8 after such a powerful performance in the Arkansas Derby, remember, these horses, especially No. 4 down, are separated by the thinnest of hairs, and, as I stated, I decided to go against the grain a little this week and follow my heart and look for several less obvious horses who I have taken a liking to all year. Also note that the Derby will be Creator’s ninth start in 7 1/2 months, all two-turn races, so he has a lot of mileage under him and comes back in three weeks. But I really can’t find any faults with this colt, who displayed some broken field running, has a devastating closing kick, as do so many others, and is getting good at the right time. He gives Asmussen quite a one-two punch with Gun Runner. His maiden victory after a rash of seconds was so spectacular and so out of character from his previous starts I commented that he looks like a live future book horse, for which he was 250-1 at the time. He did have a dream trip at Oaklawn, rallying along the rail before easing out and finding a perfect seam between Unbridled Outlaw and Discreetness. And he did benefit from a very fast pace (:22 4/5, :46 1/5, and 1:10 3/5) set by a horse with the same ownership, who may or may not have gone hell bent for leather for the purpose of setting it up for Creator. Either way, their other horse, Gettysburg, ran a terrific race. But as mentioned, he did show the kind of broken field running you need from a deep closer. He then roughed it up a bit with Whitmore, basically shoving him out of his way, which is another trait you want to see in a Derby horse in a 20-horse field. He has a powerful a closing kick and continues to improve with every start. 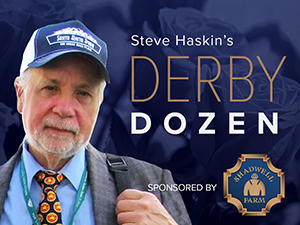 What makes this year’s Derby so perplexing are the number of powerful deep closers – Creator, Suddenbreakingnews, Brody’s Cause, My Man Sam, Mo Tom, Trojan Nation, Cherry Wine if he miraculously gets in, and now perhaps Exaggerator if he runs like he has in his last two. One thing of which there is no doubt about Creator is his ability to get 1 1/4 miles. His dam, who was bred in Peru, was a multiple stakes winner at 1 1/4 miles and placed in graded stakes at 1 1/2 miles. Sent to the U.S., she placed in four graded stakes. Creator’s broodmare sire, Privately Held, finished second in the Meadowlands Endurance Stakes at 1 3/8 miles. His maternal great-grandsire, Summing, won the Belmont Stakes, and he traces to Diatome, who won the Washington D.C. International after finishing third in the Arc de Triomphe to the legendary Sea-Bird. And of course Tapit has sired a Belmont Stakes winner in Tonalist. Hmm, so what the heck is he doing at No. 8? If you think Creator is ranked too low, what about his stablemate, who is ranked in the Top 5 on most of the Derby lists? The reasons I have him ranked this low are the six-week layoff, his slow Beyer and Thoro-Graph figures, and the lack of success of Louisiana Derby winners in the Kentucky Derby. Some felt Dazzling Gem’s performance in the Arkansas Derby moved Gun Runner back a little. But I’m looking at it just the opposite. I thought Dazzling Gem, who was third in the Louisiana Derby, ran an excellent race coming back in three weeks, making a big move on the turn, and being right there at the eighth pole, eventually tiring a bit to finish fourth. I feel that his performance actually moved Gun Runner up, and also moved Mo Tom and the overall form of the Louisiana Derby up, which made it even harder to rank him this low. But another factor is that Gun Runner does so much drifting and changing leads, you have to think he can run faster once he gets his act together. But you don’t want to see a horse doing that in the Kentucky Derby. He’s fortunate he had such a ground-saving dream trip in the Louisiana Derby and that Mo Tom got wiped out twice in the stretch. The runner-up, Tom’s Ready, is a solid honest horse, but he’s 1-for-8 in his career and has lost five straight races. Gun Runner has had only had two starts this year to work out the kinks, and you have to wonder if another start would have helped him, especially having to now go into the Derby off a six-week layoff and trying to do something no horse has ever done – win the Kentucky Derby straight from the Louisiana Derby. As I’ve mentioned, this could be Asmussen’s year for the Kentucky Derby–Hall of Fame double, something that Wayne Lukas, Gary Stevens, and Neil Drysdale all accomplished. And Gun Runner does have one of the stronger pedigrees, with his dam being a half-sister to Horse of the Year and Breeders’ Cup Classic winner Saint Liam and his female family tracing to the great Gallorette. And his inbreeding to Fappiano and Lyphard sure doesn’t hurt. So, there is an awful lot to like and also a lot of question marks. I admit it, he would have been ranked much higher if he had one more start or at least had his four starts closer together. Believe it or not, he got one of the fastest Thoro-Graph figure of any of the major Derby preps in the Wood and is on a very strong pattern. But again, he is light on experience, with one of his four starts coming last April 23 at 4 1/2 furlongs and then a 10-month layoff to his next start, which was a 6-furlong allowance race at Tampa. So, not only does he have only four career starts, two of them were in sprints, and he’s coming into the Derby off only three starts in 12 months, and didn’t make his two-turn debut until March 12. But he has gotten as much out of his two distance races as anyone could hope for. He has two starts at Tampa and a gut wrencher in the mud at Aqueduct. And in one of those starts at Tampa, his two-turn debut in the Tampa Bay Derby, he pushed his stablemate Destin to a track record, while jumping four points on Thoro-Graph and then coming back and winning a grade I with a combination of speed and guts. It’s just a question of what he beat in that race, defeating an 81-1 maiden by a head and no Top 12 horses. He did seem to goof around a little in the Wood, running with his ears pricked until he was threatened, so although he no doubt is extremely talented and has survived his first slugfest under adverse conditions, his best races appear to be down the road a bit. Would it be a shock if he were to win the Derby? Nothing would be a shock this year, but he does have history to overcome, as several of them do, and we have to see what the pace scenario will look like, especially the plans for Danzing Candy, who as of right now is the only other pure speed horse in the race. Without Danzing Candy, Outwork would obviously move up as the controlling speed, with an inordinate amount of deep closers having to make up tons of ground. Like with Creator and Gun Runner, don’t let the No. 10 ranking fool you. This a very good horse who is not going to make it easy for Nyquist and could wire this field if Danzing Candy defects. Here yet is another horse ranked lower than he should be for reasons other than his ability. Yes, I know I had this horse ranked second only a few weeks ago, because I feel he’s as talented and as fast as any of them, and it kills me to drop him this far. But as a historian and one of the self admitted dinosaurs, I have to retain some sense of tradition and history, and I will let him pave a new path in Derby preparation. But I have to see it accomplished first before I can accept such a deviation from the norm, and an unscripted one at that. This was not their original plan of attack, and it was a monster jump on the Sheets that dictated the dramatic change. But if he can win the Derby off an eight-week layoff and never having been farther than 1 1/16 miles, then all the power to him and his team for writing a new chapter in training for the Derby. Look, things change week to week, and who knows how I’m going to feel about him next week or after seeing how trains at Churchill Downs. He turned in a strong 5-furlong work in 1:00 4/5 in company, with the rider way up in the saddle and not asking him, while finishing over a length ahead of his workmate, who was being urged to keep up. He then galloped out 6f in 1:14 1/5, up 7f in 1:29 1/5 to put some much needed bottom in him. So that at least is an encouraging step in the right direction. From a pedigree standpoint, his definitely is one of the strongest, with plenty of stamina on the female side. He is a full brother to Creative Cause, winner of the San Felipe and placed in the Preakness and Santa Anita Derby. His dam earned almost $1.2 million, winning the Apple Blossom and placing twice in the Santa Margarita. His maternal great-grandsire Skywalker won the Breeders’ Cup Classic and his third dam is a half-sister to Cal Cup Classic winner My Sonny Boy. His tail-female family also includes Properantes, winner of the marathon San Juan Capistrano, and Opening Bid, winner of the Santa Anita Oaks (then Santa Susana), Oak Leaf Stakes, and Milady Handicap. So far, his works have been excellent, but as I’ve been saying, he is really bucking history trying to win the Derby this way. He has the talent, class, and speed figures, but that has never been done in modern times. From a handicapping angle, he is still the fastest 3-year-old on Thoro-Graph and three horses he defeated at Tampa this winter have come back and run huge – Blue Grass winner Brody’s Cause, Wood Memorial winner Outwork, and Gettsysburg, who ran a big race in the Arkansas Derby. This is my new longshot sleeper. There are so many factors that pointed me to this horse, not the least being he did finish second to Nyquist coming off a maiden race, and he made a huge impression on me as I watched the gallop out. I watched the race over just to study him more closely, and something caught my attention that may prove meaningless, but it nevertheless was eye opening enough to put me in a new direction. I had commented after the race how impressed I was with the way Nyquist was extending his stride at the finish and running through the wire. This time I watched his gallop-out more closely and he was really motoring around the turn with not another horse in sight. Then as he continued around the turn, I was shocked to catch a quick glimpse of Majesto actually about 5-to-6 lengths ahead of him. My first question was how in the world did Majesto get that far in front of Nyquist so quickly, when Nyquist was himself galloping out so strongly? Nyquist kept galloping out at a brisk pace and it wasn’t until they neared the backstretch that he finally caught up to Majesto, who was being pulled up at that point. I went back and watched his two previous races more closely and loved everything I saw, which basically was a big, long-striding horse, who reminded me very much of his sire, Tiznow, in looks and style, but who was still green, with his ears up and head held high, and obviously just learning what this game is all about. Looking back at his earlier PPs, he was beaten 1 1/2 lengths by Destin in his career debut going 7 furlongs, and in his second start, he finished second, 6 1/2 lengths ahead of Gettysburg. In his next two races, he finished behind Happy’s Causeway, but came back to beat him by 4 lengths in his maiden victory, showing just how much he had improved. In that maiden score he was parked 4 to 5-wide the entire race, but used his high cruising speed to jump on the leaders and draw clear. The horse he beat, Dig Deep, then came back to win impressively on the Florida Derby card, getting the mile in a sharp 1:35 4/5. Majesto made a humongous leap forward in the Florida Derby, in which he cruised right up behind the leaders and looked ready to mount a serious challenge at the 4 1/2-furlong pole, but had to shut it down when he ran up behind a tiring horse and dropped back from third to fifth before commencing his big rally up the inside. Although he couldn’t match strides with Nyquist, he gamely turned back the challenge of the multiple graded stakes-placed Fellowship for second. He now has the distinction of having three run in 1 1/8-mile races, as well as a 1 1/16-mile race, so he has plenty of bottom under him. He’s an April 28 foal, so he still hasn’t turned 3 yet, and I love that he has been training at Gulfstream West (Calder), which as we know really gets a horse fit. Despite his size, he still brought $300,000 at the Keenelend September yearling sale. (See more in Knocking on the Door). To continue, MAJESTO’S trainer Gustavo Delgado is a high-percentage trainer, who was the top trainer in Venezuela, saddling four Triple Crown winners and twice winning one of South America’s most prestigious races, the Premio Simon Bolivar. Several years ago, Delgado’s assistant was none other than Juan Arias, who trained Canonero II to win the 1971 Kentucky Derby and Preakness and was having trouble getting back into racing, so he joined Delgado’s stable. To show how proficient a trainer Delgado is, he’s been training in the U.S. for only three years and not only has a Florida Derby runner-up in this year’s Kentucky Derby, he has Gulfstream Park Oaks runner-up Paola Queen in the Kentucky Oaks, and grade II MacDiarmida winner Grand Tito in the Woodford Reserve Turf Classic. Yes, Majesto looks a bit too slow at this point in his career, and he did lose ground on Nyquist in the final furlong. I’m not brazen enough to say he can win the Derby, but I do think he is improving rapidly and still has a lot more room for improvement, and is just now beginning to blossom into a top-class horse who perhaps can make his presence felt at a monster price. Hey, I’m just looking for any new angle I can find. With the field of 20 now firmly set, I can extend the rankings. This is another horse who would be the Top 12 in any other year, but with such a huge evenly matched crowd trying to shove its way into the gate, and with him still at No. 21 at the time I had to send in this week’s Dozen for the magazine, I had no choice but to put aside his two disastrous trips/rides that cost him many points and keep him here for now. Now that he’s definitely in, I might reconsider his ranking. I really do admire his consistency and the number of times he has had his engine completely shut down in full flight, yet managed to regain his stride and made a second or third run, just missing out on important placings. A lot of horses would have gotten discouraged, but he showed his class, guts, and resiliency by shrugging it off every time. Most people, including yours truly, feel he would have beaten Gun Runner in the Rebel had he not been stopped cold on the rail, and he definitely would have been no worse than second in the Louisiana Derby had he not been stopped cold twice at about the same spot. He also most likely would have caught Mor Spirit for second in the Kentucky Jockey Club Stakes had he not swerved in on the rail on his own while making a huge move. I feel badly for the horse and his connections, and feel Amoss’ and GMB Racing’s frustration, and I can see my sentiments taking over and forcing me to move him up into the Top 12 before all is said and done. And remember, he is a graded stakes winner at Churchill Downs. Heck, I’m already starting to have second thoughts about leaving him off. If I was looking a huge huge overlay in the Derby, at least to put in the exotics, it would be him. Everyone is down on him, and most feel he shouldn’t even be in the Derby. But if you were disappointed with his fifth-place finish in the Wood Memorial, just watch the stretch run and you will see every horse in a clear path without a speck of mud on them, and then you will see him, ears pinned, his face and body completely covered with mud. As I wrote last week, I don’t feel he ran as bad a race in the Wood as most people think, considering the trip he had from the rail, dropping far back, always looking for running room, and never really getting a clear or a clean run. Just after the start, Adventist came over on him, knocking him off stride slightly, causing him to turn his head in, just enough for him to lose contact with the field. He actually had to run his second quarter in about :23 1/5, while some 8-10 lengths off the pace, which is not how he wants to run. He should have been sitting right off Outwork’s flank at that point. He showed good acceleration going into the far turn to quickly close in on the field, only to run into a wall of horses and a wave of kickback and lose all momentum. After having to pause, he got in gear once again and closed in on the leaders, but had to squeeze his way inside Tale of S’avall, bumping with him. With so few tactical speed horses in the Derby, I see him sitting in a good position right behind the leaders and using that Tabasco Cat and Temperence Hill (both Belmont winners) stamina to make his presence felt in the stretch. Although Temperence Hill, who is farther back in his pedigree, won the Belmont on an off track, Shagaf’s maternal great-grandsire, Tabasco Cat, hated it in the Derby. This is a sneaky horse who could surprise a lot of people. I will say this for the colt, in my pedigree analysis I rank his pedigree No. 1 among all the Derby horses. In addition to being by Tapit out of a Sunday Silence mare, his dam was a grade I winner in Japan at 1 1/4 miles. His third dam, Arkadina, by Ribot, out of Alabama and Monmouth Oaks winner Natashka, was a group III winner in England and placed in the English and Irish Oaks and Irish 1,000 Guineas. Arkadina is a half-sister to Test Stakes winner Ivory Wand, granddam of Elusive Quality and BC Juvenile winner Anees; half-sister to Gregorian, a group I winner in Ireland; full-sister to Blood Royal, winner of the Jockey Club Cup and Queens Vase at Royal Ascot; and half-sister to Truly Bound, winner of the Ashland, Fair Grounds Oaks, and Cotillion. And Sunday Silence’s progeny earned another worldly $713 million. By winning the 1 3/16-mile UAE Derby, racing very wide a good portion of the race and stumbling badly at the start, he essentially ran the Derby distance of 1 1/4 miles. In short, he is going to relish the distance. I can’t put my finger on the quality of his UAE Derby victory, as he seemed to be going nowhere in the stretch until his fellow countryman Yu Change began tiring in the final 200 yards, and many feel the favorite, filly Polar River, was the best horse, getting beat three-quarters of a length after getting stopped in the stretch. He is pretty much a guess, but a very intriguing one at that. And if a foreign invader like him is ever going to win the Derby, this is the year to do it, just as 1971 was the right year for Canonero II. He’s run second in four stakes, but has only one victory in eight starts and made his way into the Derby field with a solid enough second in the Louisiana Derby. After Dallas Stewart’s back-to-back runner-up performances in the Derby with longshots Golden Soul and Commanding Curve, both at odds of over 30-1, you can bet this horse will take a good deal of place money. He’s not as good a horse as GMB Racing’s other Derby horse Mo Tom, and likely would not have run second if Mo Tom hadn’t gotten stopped twice, but he is a hard knocker, and you never know who’s going to nab a place or show spot in the Derby. He’s certainly bred to go the distance and he’s won two in a row, and came within a head and a neck of winning five in a row. He outbattled a good horse in Azar to win the Spiral Stakes, and has been one heckuva claim for Ken Ramsey and Maker, who got him for $75,000 last October. The problem in assessing him properly is that in seven lifetime starts he’s never run on dirt, with six of his starts coming on the grass. He won on Polytrack at first asking in the Spiral and now they hope he can do the same on dirt. Ramsey did not make him a late nominee, so he’ll have to put up a $200,000 supplementary fee or find someone willing to split the fee and share in the Triple Crown earnings. Being ranked 19th after closing from far back to get beat a head in the Wood Memorial sound preposterous, unless you’re still a maiden in six starts who had never even finished second before the Wood and no doubt benefited from a fast rail that did not even have a hoofprint on it, it was so much faster than several paths out. Despite coming from last, Trojan Nation looke as if he didn’t have a speck of mud on him. He just a clear ground-saving trip over the best part of the track. I don’t have a clue how to assess his performance. He did come from California and had run third to Cupid in a maiden race, and he was coming off a :59 4/5 bullet work at Santa Anita, the fastest of 59 works at the distance. So, is he just improving in leaps and bounds from out of nowhere or was the Wood just some sort of fluke performance. Who knows? He has the pedigree and his 93 Beyer figure is not that bad this year, so I’m just putting him on the back burner, and we’ll see what he does. What else can you do? As good as he looked winning the San Felipe wire to wire, that’s how much he self destructed in the Santa Anita Derby, blazing along in fractions of :22 flat, :45 1/5, and 1:10, which was sheer suicide. He showed in that race he cannot rate, or at least has never been asked to. The strategy to send him out of the gate was baffling, considering this was a good opportunity to try to teach him to rate. Anything even remotely close to that kind of pace in the Derby will send him hurtling to the back of the pack. Unless they have some tricks up their sleeve, the Derby does not look like the kind of race that will suit him right now. He’s obviously very fast and very talented, but this isn’t the way you want to come into the Derby. Waiting in the wings are several pretty good horses, who belong in the Derby as much as most of them. They are FELLOWSHIP and ADVENTIST, followed by LAOBAN and DAZZLING GEM. You have horses who finished third in the Florida Derby, third in the Wood Memorial, fourth in the Blue Grass Stakes, and fourth in the Arkansas Derby. All of these were excellent performances, and if they don’t make the Derby, they would be serious horses for the Preakness.